After four decades, China and the U.S. should jointly explore a path of co-evolution. China has no wish to be the United States’ enemy and it would be unwise and wrong for the U.S. to antagonize a country that shares extensive common interests, a Chinese media expert said at an international symposium commemorating the 40th anniversary of the normalization of Sino-U.S. diplomatic ties at the Carter Center in Atlanta, the United States, on January 18. 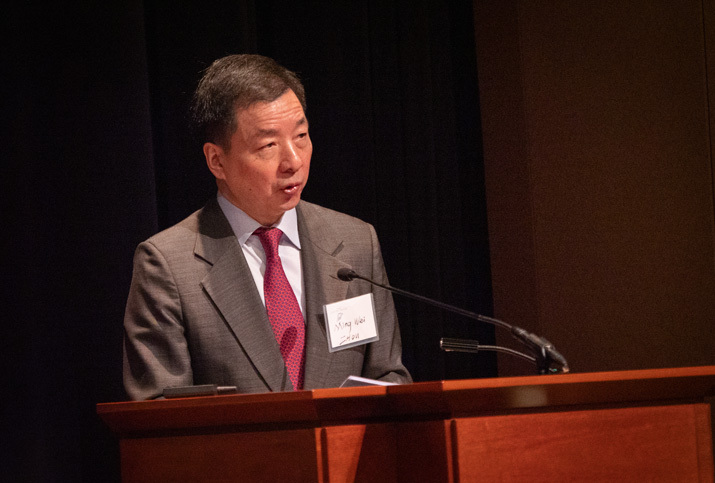 Zhou Mingwei, former President of the Beijing-based China International Publishing Group, the largest foreign language publishing house in China, said despite disagreement and problems, the world’s two largest economies should recognize the importance of a coordinated, cooperative and stable bilateral relationship to both and the world. The two countries should observe their relationship in the context of an era with “profound and unprecedented changes” and with a sense of historical responsibilities. The world has seen the rise of emerging economies, new challenges in global governance and an anti-globalization movement. Non-traditional security issues are increasing and new technologies are exerting a profound impact on the international community. At the moment, there is negative sentiment on both sides and instead of a strategic partnership, there is constant talk of a trade war, with China positioned as the main strategic opponent of the U.S. “China has no wish to be America’s enemy, and no policy that treats China as an enemy is in line with America’s interests. It would be unwise and wrong to antagonize a major country with a population of 1.4 billion and a rising economy that shares extensive common interests,” Zhou said. The relations now stand at a new historical starting point and both countries need to jointly work out a new framework for the next 40 years, Zhou said. He suggested both view each other’s strategic intentions rationally and objectively, intensify strategic communication, extend strategic mutual trust, and avoid strategic misjudgments. The U.S. should objectively view China’s development, which is based on its own logic and doesn’t aim to surpass or overwhelm any other country, and take an objective view of the desire of the Chinese to develop their economy for a better life. China should make it clear that its strategic goal is to succeed in its own development rather than challenge anyone, he said. “How China and the U.S. assess each other’s strategic intentions will directly influence the policies they adopt and the type of relationship they develop. We cannot afford any mistakes on this fundamental issue,” he emphasized. Since China and the U.S. are two major countries with different cultural traditions and different stages of development, disagreements and frictions are inevitable at times, but accusations and antagonism can’t resolve any issues but only make things worse. The key is in the attitude toward the differences and disagreements and how the problems are dealt with, he pointed out. How to work cooperatively while recognizing mutual divergences and differences is one of the key requirements of Sino-U.S. cooperation under the new framework. In the end, the two countries need to make rational choices and create positive trends. To minimize the negatives and maximize the positives is not a methodology, but also the mentality and principle of win-win solutions, Zhou said. The bilateral relations could easily go astray if not handled properly. However, the common interests far outweigh differences and cooperation is the only choice that makes sense. Both countries should adopt a strategic and long-term perspective and jointly explore a path of co-evolution, he said. 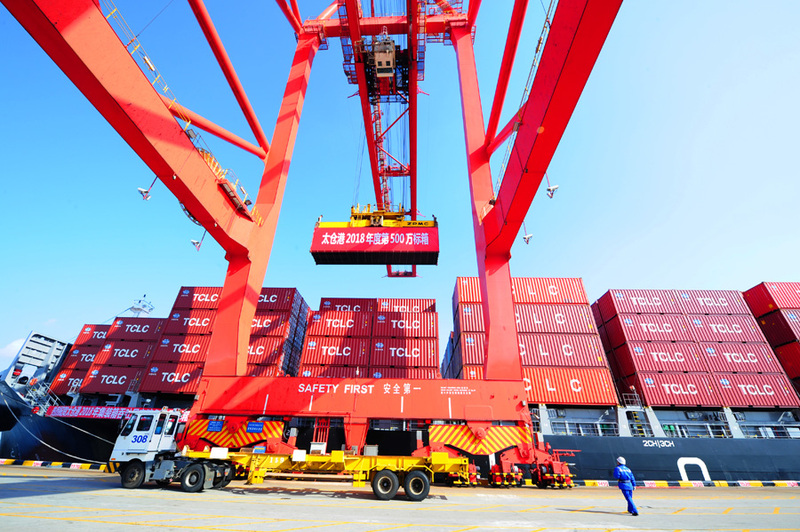 Port employees load containers onto a ship at Taicang Port, Jiangsu province. Zhou said neither China nor the U.S. has sufficient experience in dealing with each other as the top two economies. Moreover, the U.S. has never worked with a country with such a large population and rapid growth momentum. So, prejudice, conflicts of interest, and the influence of “politically correct” populism could easily lead to “zero-sum” thinking. The two countries should respect, adapt to and promote each other, combat risks, pursue interests, and achieve co-evolution. This is the way to avoid provocation and misjudgment, effectively curb hostility, fear and mistrust, and prevent zero-sum conflicts and confrontations. It is a long and hard learning process and the key lies in whether these two major countries can co-exist and co-develop in the new era, go beyond the traditional thinking that if one wins, the other loses, and join hands for the greater good. Admittedly, China and the U.S. are facing many disagreements and issues. Both sides might be dissatisfied and uncomfortable with and distrust each other. However, they should look at the future of their relations in a spirit of philosophical thinking and with a sense of historical responsibilities. History is enlightening, Zhou said. When Chairman Mao Zedong met with President Richard Nixon in 1972, they had many issues to discuss and resolve. To Nixon’s surprise, Chairman Mao did not mention a word about the issues and problems that beset the normalization. Instead, they discussed human history, the universe, and philosophy. “The philosophical issues they talked about concerned the direction of human society, their world outlook, and long-term development–not only logic, but also dialectics,” he said. “When building our relationship, we need to listen carefully to the voices and wishes of the ordinary (Chinese and American) people,” he said. There is no predetermined outcome. Any result must come from the interactions between the two. Common interests do not pop out of thin air but are formed through careful contact and cooperation. Zhou urged both sides to give up “conspiracy theories” and “imaginary enemies” and make fewer accusations and raise fewer objections. Instead, the two countries should be more honest with each other, stand in each other’s shoes, be patient with each other, and make each other feel comfortable, he said, adding they need constructive criticism and must avoid taking any extreme position.